Parging is a type of mortar surface that is applied to foundation of your home to give a more appealing appearance to both older and new foundations. There is no structural benefit to parging, it is purely a cosmetic application but when it comes to curb appeal it is undeniable you shouldn’t skimp out. 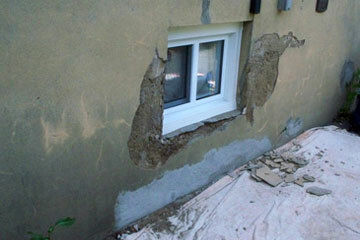 The real benefit of covering up those old blocks is to seal the foundation and provide a great appearance. It provides a clean looking finish to the exterior of your home. Available in a variety of different colors to suit your taste and design. Your home will increase your curb appeal and in return increase the resale value of your home. Ready To Improve Your Home? © 2019 Sealerman Waterproofing. All rights reserved.